Enfu's Adventure Log: A Journey through the Shoda Region! Re: Enfu's Adventure Log: A Journey through the Shoda Region! Congratulations on your victory it was a fun battle.I dont have my badge with me atm but when i do i will edit my post with my badge. Great team you have btw. You have done well and won the Sandhog Badge, now don't try and eat the Badge, it isn't a real pig. The art of Flan that is not in a can. 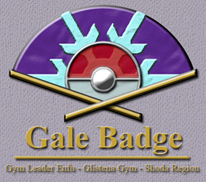 Well done Enfu for winning the Fortis badge, good luck with the rest of the gyms. Well done, the Gates of Hell will be closing now. You have successfully beaten me, I nearly beaten you, but you strive on thinking with your head. I present you, the Igneous Badge, take it, and go. Great job... I need to watch out or freezes. Enfu has defeated the Beetle City Gym Leader Rambo and won the Hornet Badge!